It never ceases to amaze me how Graze come up with so many inspirational snacking ideas. Some are a bit hit and miss, but on the whole, they’re winners. They've certainly been tasty enough to keep me as a loyal customer for the past 3 years (and I’m not even being paid to write up these reviews)! So, onto this week’s snack - Tomato and Basil Pizza. It’s not pizza in the traditional sense. 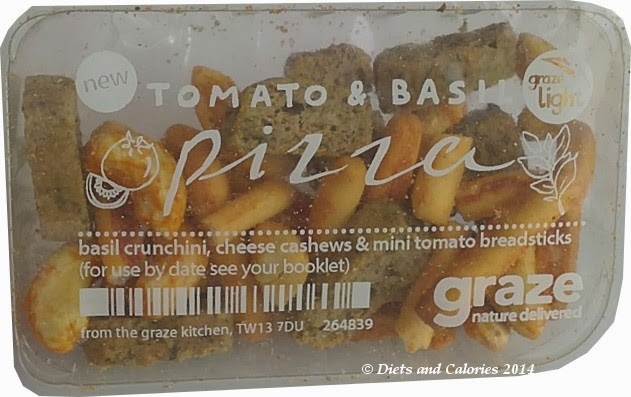 Graze’s Tomato and Basil pizza snack is a punnet consisting of mini tomato breadsticks, basil flavoured crunchinis (like croutons) and cheese flavoured cashew nuts. The 24g punnet has 120 calories. 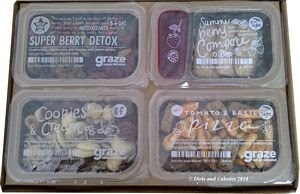 I have recently changed my Nibblebox to a Graze Lightbox, so now all my snacks will be under 150 calories. It may have narrowed down my choices a bit, but there are still many tempting and delicious offerings available. I’m so pleased Tomato and Basil Pizza are included in the Lighbox range, as they’re quite possibly one of my favourite Graze snacks. 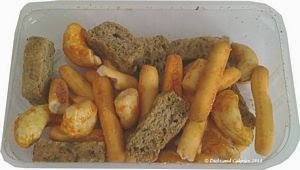 The teeny tomato flavoured breadsticks are dry, light and crunchy, complementing the basil flavoured crunchinis perfectly. The crunchinis are very hard croutons, with a slight oily texture once you’ve crunched into them. 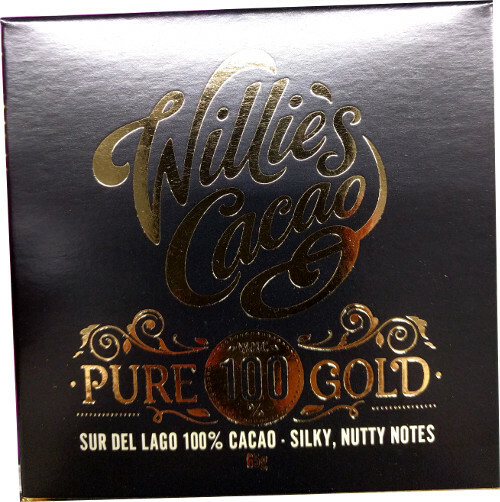 They are made with extra virgin olive oil and olive pomace oil and when combined with the basil, are utterly delicious. Cashew nuts aren’t that flavoursome on their own, so I tend not to snack on them. However, Graze have found a way of turning the ordinary cashew nut into a delicious and very moreish snack. The cheese isn’t overpowering like some cheesy snacks and the other ingredients, including garlic, paprika and onion, all combine to make them irresistible. I could have eaten tons of these, but thank goodness, it’s all portion controlled. Tomato and Basil Pizza gets a rating of LOVE from me because each individual nibble was delicious in its own right, plus I really want to get this one again! 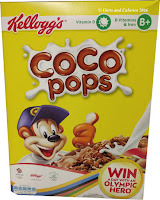 Nutrition Details: 120 calories per 24g punnet, 3g protein, 1g sugar, 7g fat, 2g saturated fat, 0.3g salt. If you’re tempted to try out a Graze snack box for yourself, you can order one completely free using this friend code: CAROLI8RB. All you need to do is log onto Graze, enter your details, choose your type of Graze box and enter the special code (CAROLI8RB) for your free box. 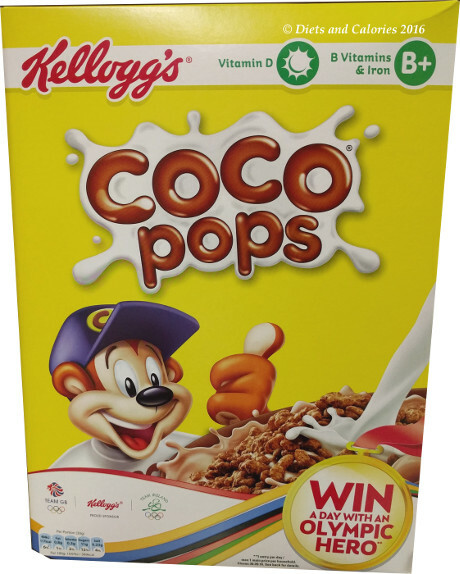 After that, you'll get your first, fifth and tenth boxes free! You can stop your deliveries at any time, whether it’s just for a couple of weeks while you’re on holiday, or permanently. You can also change how often you want your deliveries.